Today I am coming at you with a highly requested post about research and writing in law school. I will preface this with saying I am not the best researcher or writer at my law school and I am okay with that. I have learned a process for research and writing which gives me a solid end product that is correct and respectable. It has not been easy; I really struggled during my 1L year with research and writing like a lawyer and moving away from the style of writing that had worked well for me in all previous schooling. For anyone else out there who is not naturally good at legal research and writing, I hope this is helpful to you and you can learn from my mistakes and hard-earned lessons. Whenever you are assigned a research project or are doing research for a writing piece, don't just open up Lexis and start typing in the search box. Find a basis in the law for your research. If you are doing an appellate brief, you will have a record and opinions to work from. Start with some of the case law cited in the opinions and that will give you a jumping off point. If you are doing a memo, start with the narrow area of law and find out what cases influence that law. Having a starting point makes research much easier because you don't have to wade through the 1,000+ results you would get from a basic word search in Lexis or Westlaw. Why search through all case law from the beginning of time if you need only recent cases? That is a waste of time. Use the filters to narrow your search by time frame, controlling jurisdiction, etc. It will save you tons of time because it will narrow the scope of your search. I know you probably hear this over and over again but seriously, Shepardize your cases. Not only does it ensure that you are using good law, but it can also provide you with further cases to cite to bolster your point by finding cases that have cited to the case positively. Also, negative treatment can be helpful- for example, if you find a case that goes against the point you need to make, look to the negative treatment for cases that have disagreed and may bolster the ultimate point you are trying to make. If you are researching an issue of law that relies on regulation or statute, start with that statute. Find which cases cite to that statute/regulation and the particular area you are working with. This will save you time by narrowing your scope of cases to look through. Don't spend 3 hours on something if you can get it done in 1 hour just to say you spent all that time. That is a waste of time. Be strategic and effective with research so that you get it done quickly and effectively without wasting tons of time. Just because you spent hours and hours researching does not mean automatically that you did a good job. I know- many of us came to law school to avoid Math but hear me out. Writing any kind of paper is basically just a big Math equation. Here is a general approach. You will need to adjust for certain papers like an Appellate Brief will have more things to account for space wise (table of authorities, statement of facts, the issue's presented, the standard of review, etc.). If you use this strategy, it makes a big paper (like a 30-page appellate brief) seem much more manageable and less daunting to take on. I also always make an outline of the arguments/points I plan to make and what research I have to back up those points. 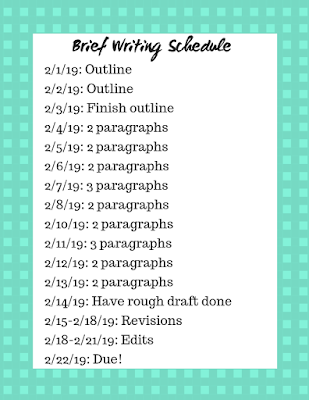 I use my outline as a checklist as I am writing so that I have a skeletal idea of where I am going and what I need to write. 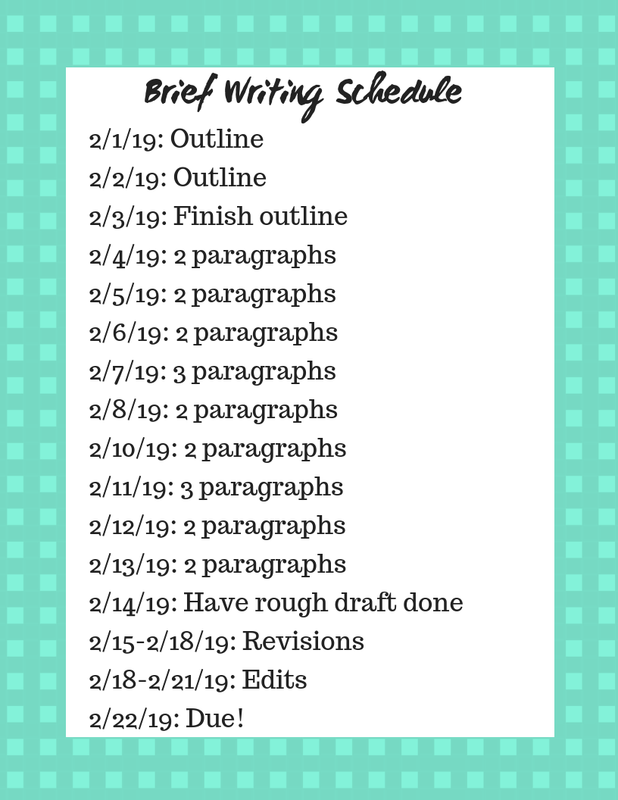 The reason I like to break down papers into the number of paragraphs I need to write is to set my writing schedule. Unlike undergrad when I could pump out a paper in a few hours the day before it is due, I simply cannot get away with that strategy in law school. The papers are too important and too exhaustive and must be done over time. I like to do my schedule by taking the days until the paper is due, subtracting 3-5 days for editing right before the due date and whatever is left is my writing time. Depending on the number of days, I make a manageable writing goal for each day. Here is an example of my writing schedule for the brief I have due for my moot court problem. As you can see, I have allotted time for outlining my arguments, writing the bulk of the brief, revising and editing. I set these self-imposed daily goals to keep myself on track and to avoid procrastinating. One of the most important parts of my writing process is leaving ample time to edit. I will talk about my writing process more in the next point but I don't write my initial draft in a way that could be turned in as a final draft. It will be messy and full of errors but it gets my thoughts and arguments down on paper and I leave time to fix the problems in my revision and editing stage. I think a big mistake people make is not leaving ample time to edit and having to turn in work that has grammatical errors that would have been easy fixes if edited. Read it out loud- sometimes things sound right in your head but not out loud and that means you need to fix them. Don't edit right after finishing the first draft. Take a little time away, refresh your mind and come back to it a few hours or a day later with fresh eyes. You will catch so many more errors this way. Don't forget about the thesaurus tool- this is a great way to fix any word repetition issues. One mistake I used to make was sitting there staring at an open word document waiting for the perfect, precise words to come to me before I started writing. I don't do this anymore because it was a HUGE waste of my time. Now I use what some call the "mad scientist" method. I just start writing. I don't think about grammar or structure or anything- I just WRITE and let the ideas flow out. Once I get going, I find that my ideas start making more sense and become more and more clear the longer I go. I save ample time for revising and editing so at this point, I am just getting the bulk of the argument down in the most natural and flowing way I can. During revisions, I will make it more precise and clear but the information and arguments will already be there in a rough way; they will just need some polishing. I never write my intro first- I start with the conclusion. I start by writing down my end goal and the point I am trying to prove with this paper. Then I write the body which will enforce and bolster that point with valid arguments and research to back them up. After all that is done, I make an introduction that lays out a roadmap of where my paper is going and what it is trying to prove to you. I always like to use some conclusory statements in the intro as well because I want the point of my paper to come through loud and clear. Good writing will have a solid structure. For paragraphs, I like to start with a strong statement of what this paragraph will be informing the reader of (think topic sentence). The middle of my paragraph will be the backbone for that statement; this is the why and how. Lastly, I finish the paragraph with another statement of what the point of that paragraph was. If there are points of your argument that are weak or counter-arguments, bury them in the stronger stuff. 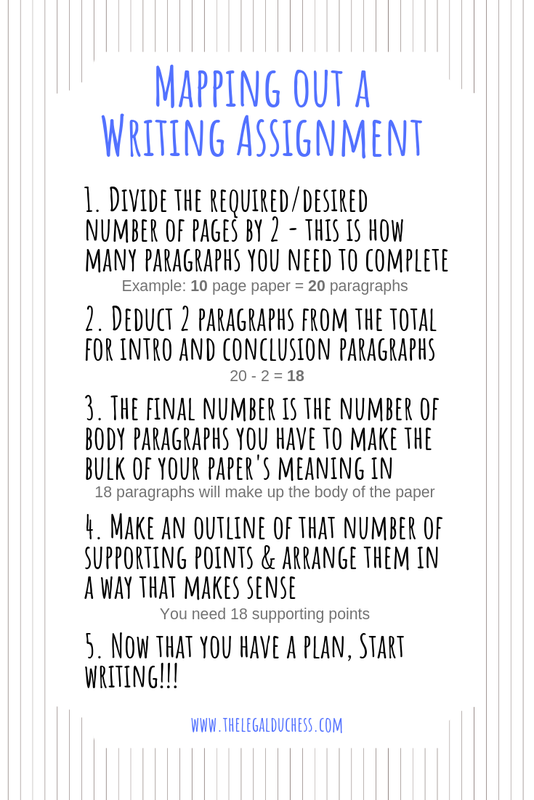 For example, make a strong point at the beginning of the paragraph, put the counterargument in the middle and then finish off with a strong point again. This will take some of the punch out of your weaker points or the counter-arguments. ****For those writing briefs, I cannot recommend this book enough! 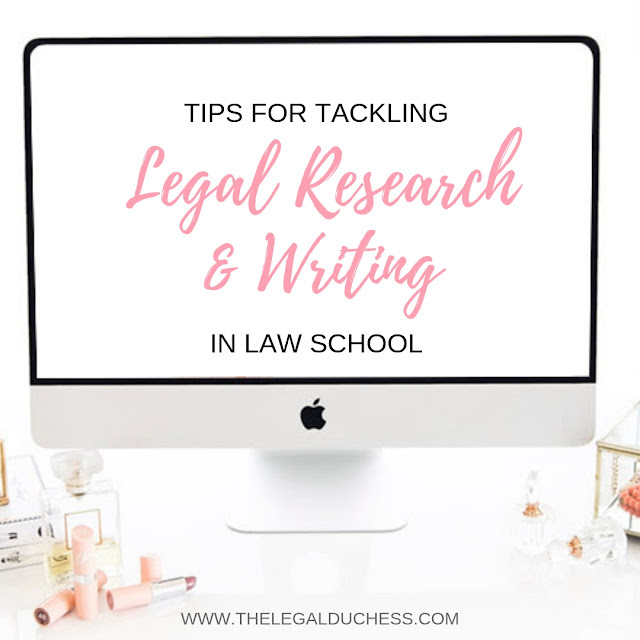 It has been SO helpful to my writing process and I plan to use it long beyond law school in my legal practice. I hope this is helpful!!!! Just a reminder, what works for me and my writing process might not work as well for you. In the long run, you need to do what works best for you. 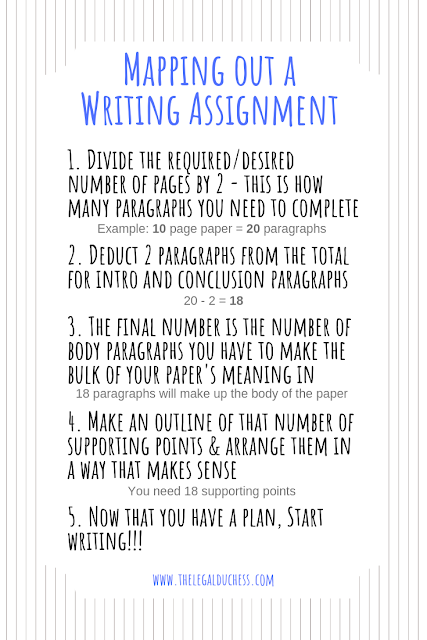 Take what you can from this and what you find most helpful for your personal writing process!! Best of luck!